Anna’s Ella Doseck and Fort Loramie’s Kennedi Gephart dive for a loose ball during a Shelby County Athletic League game on Jan. 3 in Anna. The teams will meet again on Saturday in Fort Loramie. The Redskins are ranked No. 1 in Division IV in this week’s state AP poll. Fort Loramie stayed No. 1 in Division IV and Minster stayed No. 2 in this week’s Associated Press state girls basketball poll. The Redskins and Wildcats both improved to 17-1 overall with wins over Miami East and Anna, respectively, last Saturday. Anna (13-3, 8-1) received votes in Division III while Versailles (13-3) remained ranked No. 6. 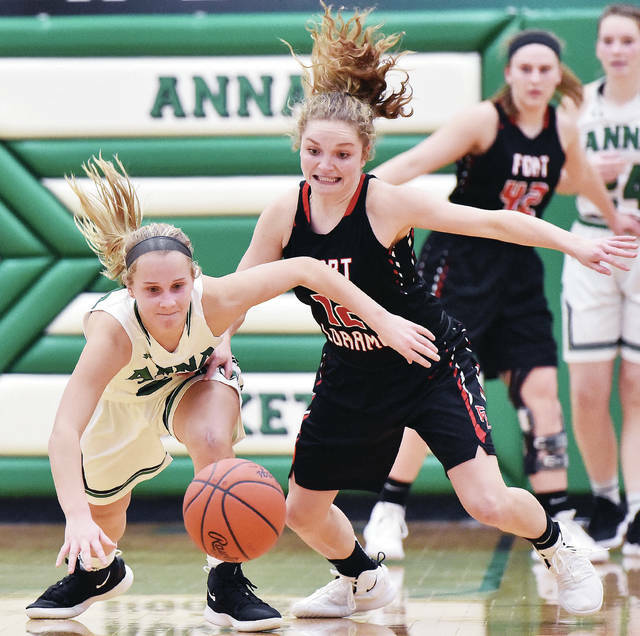 Anna will travel to Fort Loramie on Saturday for a Shelby County Athletic League showdown. The Tigers will travel to Minster on Thursday in a Midwest Athletic Conference showdown. Others receiving 12 or more points: 11. Akr. Hoban 26. 12. Youngs. Austintown-Fitch 21. 13. Dublin Coffman 14. 14. Mason 12. Others receiving 12 or more points: 11. Trotwood-Madison 31. 12. Youngs. Mooney 23. 13. Chillicothe Unioto 18. 14. Tipp City Tippecanoe 13. 15. Franklin 12. 15. St. Bernard Roger Bacon 12. Others receiving 12 or more points: 11. Anna 22. 12. Lynchburg-Clay 21. 13. Delta 18. 13. Cin. Purcell Marian 18. 15. Bellaire 16. 15. Cardington-Lincoln 16. 15. Warren Champion 16. 18. Orrville 12. Others receiving 12 or more points: 11. Covington 21. 12. Newark Cath. 15. 13. Shadyside 13.